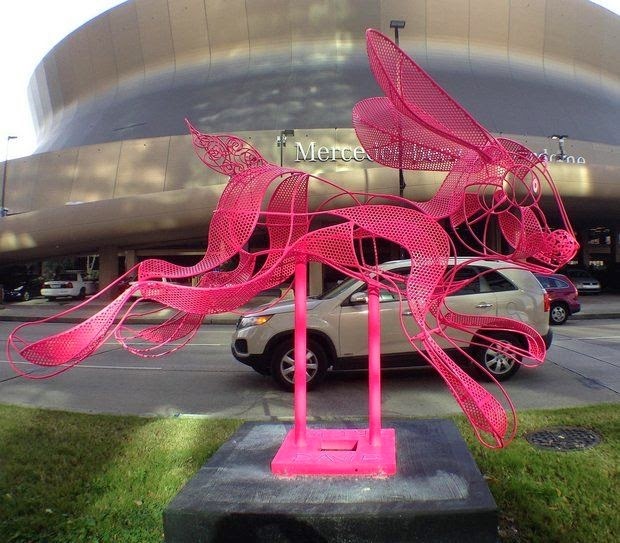 Pink Rabbit for New Orleans, Poydras Street. After Mass, L. A. Norma and I left the witch-hat-towers of Saint Louis Cathedral, and headed for the soaring balconies of Bourbon Street, where we were lifted on the chaliced wings of whiskey, served from temporal cathedrals named, Oz, and Bourbon Pub. There are many Ozs and Pubs on this street, but these two are dance-halls flanking the intersection of Bourbon and Saint Ann. Once they were populated exclusively by gay men. Then gay men and gay women. And now -- especially when balcony seating is open -- adventursome folks reading the National Geographic and taking Sea cruises. "I say skip the crucifixion, forget fasting, and go straight for the Resurrection." 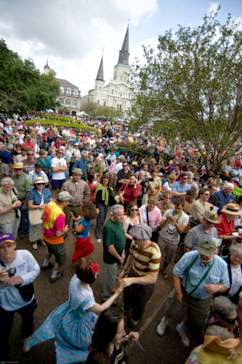 A few years back, a few blocks up the street, Chris Owens, an elderly Bourbon Street dancer with staying power, conducted her annual Easter Parade. Grand-master was David Duke. A brass band made up of midgets played, while elder ladies of the snatched-bodies cult, and a half dozen or so young bunnies in pastel furs marched and rode atop convertibles. The bunnies threw underpants to the crowd. The sinners went on about their sinning.